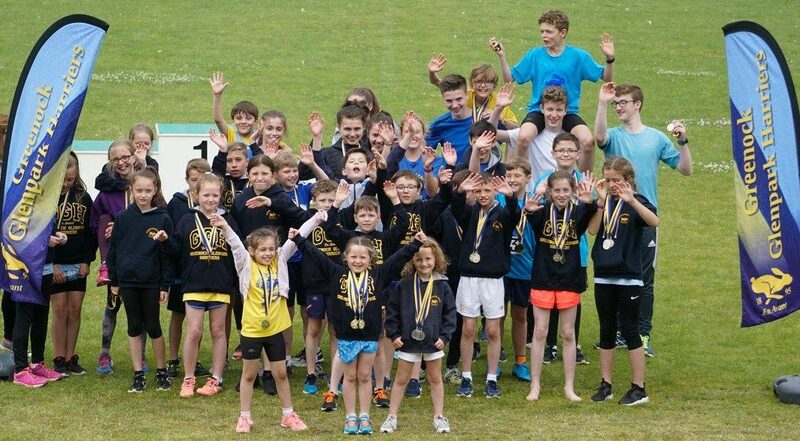 The 2018 Greenock Glenpark Harrier Cornalees Cup hill race took place last Saturday. The annual slog from Woodstock Road to Hillside Hill and back down was once again ran on a hot and sunny Saturday, testing the runners to their max. The traditional rout takes the runner from Woodstock Road, crossing the Greenock cut and making it’s way onto the stony road to Loch Thom. Runners then cut up towards the radio mast, and are soon sidetracked towards the final steep summits to Hillside Hill before flying back down to the finish. Last year, this race decided the senior championship, and this year was exactly the same. Going in to the race, Chris Mooney knew a win would secure his first senior championship. He lead from the front and put on an impressive show to see it through. Guest runner Graeme Hyett kept Chris honest throughout, and on some of the more challenging downhill stretches at the crest of the hills he closed the gap to mere seconds. But once on the open downhill roads, Chris built on his lead and flew home in under 35 minutes. Over 1 minute faster than last year’s winning time. Graeme held on for overall second place, with Paul Monaghan not far behind. Andy White was third harrier and keeps his advantage at the top of the v40 championship with 2 aces to go. Experienced hill runner Andy McCall was 4th just narrowlly pipping his Port Glasgow training buddy Daniel! Danny McLaughlin showed his experience to secure the first v50 position and 6th overall after a great battle with David Roberts, who sadly pulled up injured 150m from the line. One of the most impressive runs on the day came from junior member Ryan Brown. Ryan ran this route earlier this month and managed to take 9 minutes off of that time on Saturday! Ryan did not look out of place among the senior runners. Stephen Hanley took over 3 minutes off of his time for this race from last year, and he is also now the only Harrier to complete all club races this year. Graham McGrattan, a member of the club for over 20 years, ran this race for the very first time. Graham put in a good show too, just narrowly pipped by Richard Davidson as 3rd v50. The v50 championship is very tight this year! Marian Monk secured the 2018 Ladies championship in a dramatic day for the title race. Marian lead from the off and put in a really strong run throughout to claim the victory. Donna Clark came into the day right on Marian’s tail in the championship standings, and found herself in second place at the top of the hill in a good battle with Cheryl Thomas. However, from out of the pack came Marianne McKay who surged past both of the on the downhills to take second place. Cheryl edged Donna into 3rd place on the day. This meant that even if Donna won both the final races, she would still be 1 point shy of Marian in the standings. The club would once again like to thank all of the volunteers who helped out on the day. There were so many supporters up on the hill making sure the event ran smoothly. Next up is the Singlehurst Race next Saturday, July 7th on Rothesay. If this weather keeps up it is sure to be a cracking day out for seniors and juniors! This entry was posted in Uncategorized on June 29, 2018 by greenockglenparkharriers.